Have you ever had one of those weeks. The kind of week where everything is super crazy and you feel as though you have no time. Maybe it's the kind of week where you ace all of your exams or help someone in need. Maybe this week your bike was stolen or you creamed someone at a game of Monopoly. Okay, so maybe all of those were my week, but the point I'm trying to make is that this sandwich pretty much has you covered for any week. It's very quick, tasty, and also really healthy. It's comforting, but at the same time not too heavy. And you have so many options when it comes to toppings, it's like being a kid in a really unusual candy store. 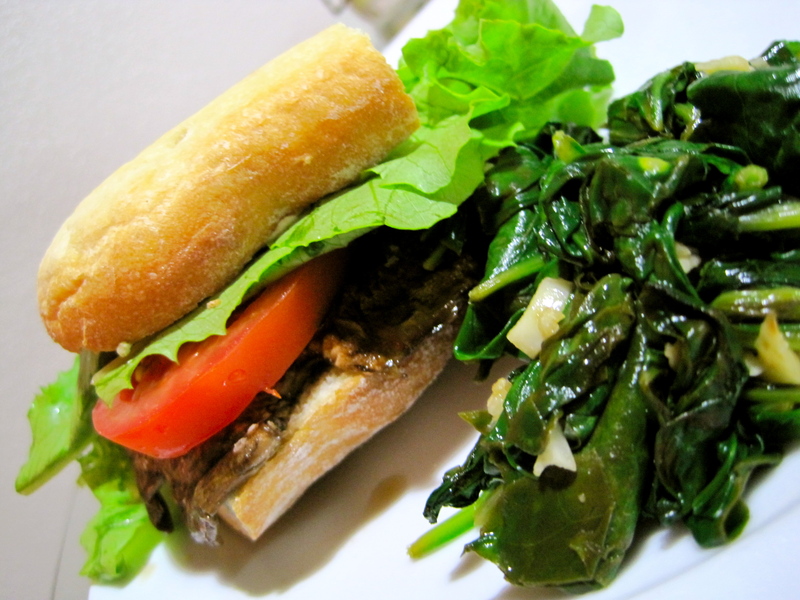 Portobello mushrooms have a very meaty texture, and they are an excellent meat substitute. Not to mention, they are basically flavor sponges, too. You can marinate them in anything and everything, Deeee-licious. 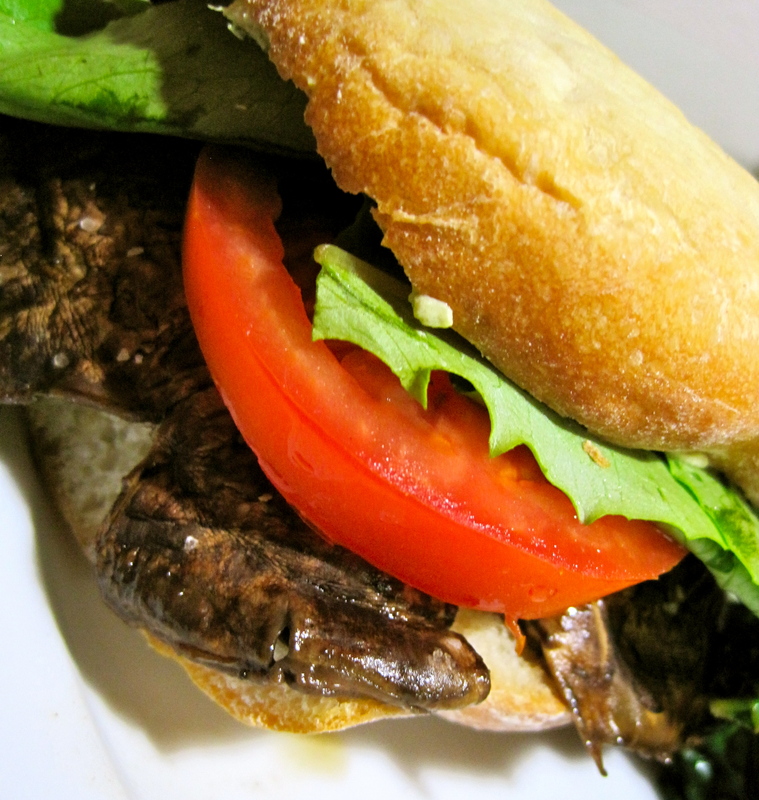 The ciabatta was a great choice for these burgers because they are super juicy and it helps to soak up all that delicious "roasty-ness". *I totally encourage you to get creative with this. Try a southwestern theme with guacamole or salsa or make it more Mediterranean with fresh basil and mozzarella! Place mushrooms in a roasting dish and drizzle with olive oil and balsamic vinegar. Sprinkle with salt and pepper to taste. Roast for 15 minutes, or until tender. Meanwhile, toast bread and prepare toppings for burger. Assemble sandwiches by spreading goat cheese on the toasted bread. 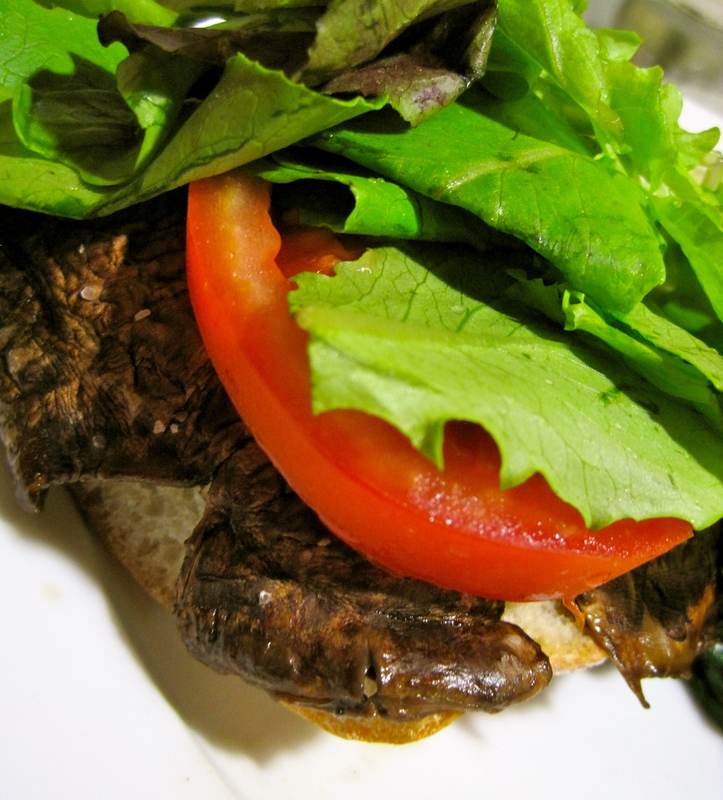 Place 1 mushroom, a few slices of tomato, and a handful of greens on top. 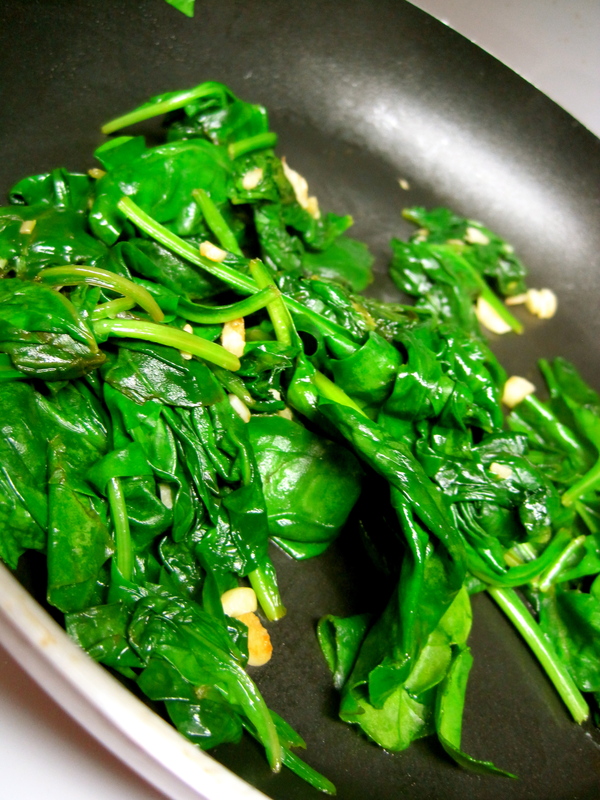 Enjoy warm with garlic and lemon spinach (below) or crispy sweet potato fries. Toss in spinach and cook until wilted, stirring occasionally. Squeeze in lemon juice. Serve warm with parmesan, if desired.